Proper hook timing and spacing are the keys for missed stitches or frequent thread break problems. All the advice are related to oscillating hook since it is most widely used and because I have experience with this kind, but principles for both stay the same. If the timing is delayed too much tip can simply miss the thread loop or cut it out like a razor, otherwise if it is too early probably it catches the thread correctly but releases it to late what causes the thread to broke or stay on hook while pulling starts. Hook tip needs to be sharp, all the surfaces smooth and polished without any sharp edges or burrs. Any imperfections can be aligned with some fine sandpaper and felt polishing pad and polishing paste. 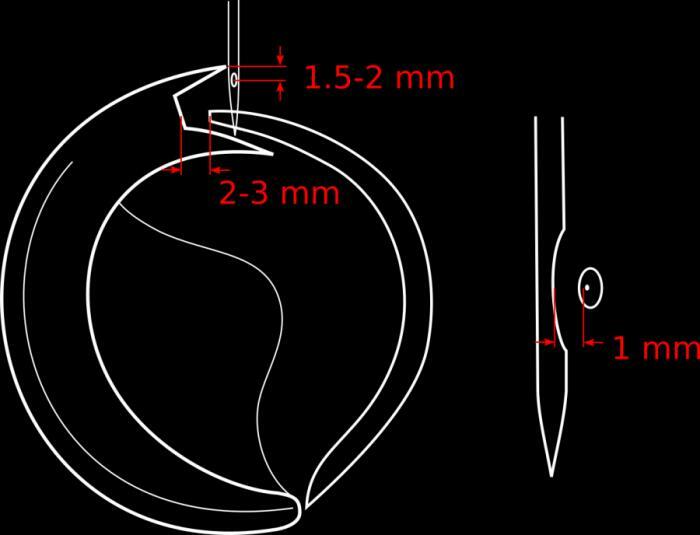 Generally distance from the bottom of needle eye and hook tip, when it starts to touch a needle, is a measuring point and it ranges between 1.5 - 2 mm. Well, to confuse things and to get this measurement to work needle height on its mechanism must be correct as well, commonly it is adjustable by loosing some other screw under the crankshaft. Needle tip at its lowest position should be very close to bobbin drum casing, but should not touch it (or get into special hole in it). Hook tip must be at proper spacing from the back of the needle, about 1 mm, this distance is adjustable in many different manners on different machines. Furthermore there is other thing to mention - hook backlash, it is a distance from a hook solid to a bended piece of metal which propellers hook oscillations. This gap is about 2-3.5 mm, and only way to adjust that is by bending the metal piece component - don't confuse it with thin flat spring!. When everything is properly, thread practically jumps out for itself from the stitch plate on test turn. Thread tensioner is a simple thing - usually two plates with thread in between, all pressed together by spring with tension adjustable by some screw. Tension values used for embroidery are the lowest ones (at most 1/10 of the whole tensioner scale) and should be uniform for all the work time. Most sewing machines loose the tensioner on foot being raised, start searching here for blockage problems. Use correct stitch plate - some machines have zig-zag option plates, avoid them and use single hole plate for straight stitch. It might seem obvious but it happened to me so remember about this little detail: tighten the needle holding screw with screwdriver, you don't want the needle to stay free in the middle of the work. Use correct threads, depending of the pattern design. Any threads should work but if the embroidery is dense and you are trying to use thick ones then problems will come out quickly. Stabilizers are the option but are almost necessary for stretchy fabrics, faster speeds and for higher quality finishing.